Fr. William Wagner, ORC: In these conferences Fr. Wagner presents the biblical roots for the devotion to St. Michael, whose essential mission is the defense of Faith, his name meaning, “Who is like GOD!” He defends Israel against her enemies in the book of Daniel. In the Apocalypse we find that it is he who, under the Banner of the Blessed Virgin Mary, took up battle against the reprobate spirits who refused the mystery of the Incarnation and who refused to serve Christ and the Church. 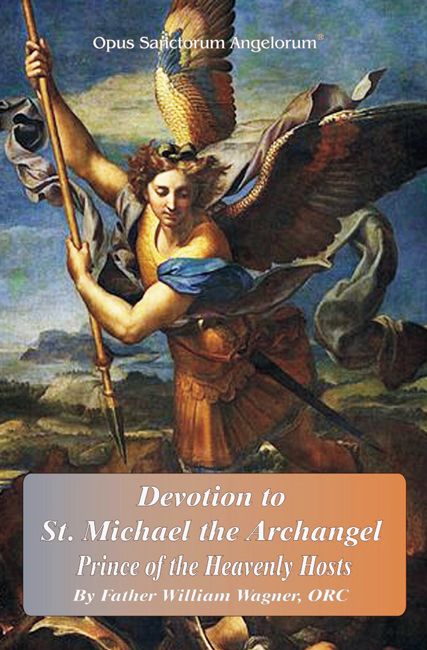 By divine design from the very beginning St. Michael has been appointed the Angel of Faith, the Protector of the Church as well as the protector of the Dying (since the last choice in faith for Christ guarantees salvation).